The terrestrial ancestors of whales first entered the water some 50 million years ago in the region around India and Pakistan, possibly to protect themselves or to feed. They subsequently spread until they eventually reached the ranges we know today. What path did they take and when? In 2011, in Peru, a research team discovers a 42.6 million-year-old, quadrupedal whale fossil, the oldest one of its kind to be found in the Americas. The fossil is now the subject of a study published in Current Biology that provides answers as to how whales spread across the world’s oceans. Based on the fossil, researchers were able to determine that the four legs of the whale allowed it to lead an amphibious way of life, meaning it could live both in water and on land. The structure of its limbs shows that it was able to support its bodyweight, but that its movement on land was probably laborious. The whale most likely came out of the water to rest and to give birth, in the same way as modern-day aquatic mammals such as otters and seals. In the water, the whale could swim with its feet – which were probably webbed – and a tail that could wave up and down. However, it is not known whether its tail was composed of two lobes like today’s whales, as the last vertebra was not found. This whale was capable of eating large fish. The discovery of a quadrupedal whale is not exceptional: several ancestral species of this type are already known. What is new is rather to have found one in the New World. 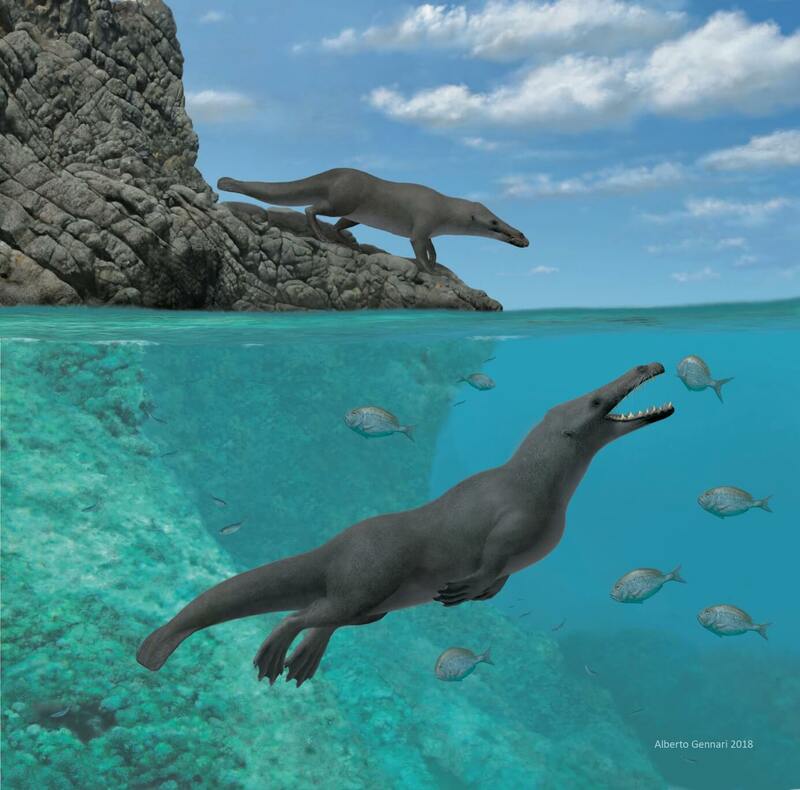 The fossil has been named Peregocetus pacificus, from the Latin pereger, which means “to travel overseas”. It is believed to have been the first whale species to cross the Atlantic Ocean. “At that time, the distance between Africa and South America was twice as short as today and there was a surface current between the two continents. These two features probably helped Peregocetus pacificus to cross the South Atlantic,” explains paleontologist Oliver Lambert. The whale could then have travelled to Peru by bypassing South America from the north, as shown in the video. Scientists already knew that cetaceans had arrived in North America roughly 41.2 million years ago, but the route they took and their means of locomotion remained unclear until now. In other words, it was not known whether whales had lost their hind limbs before or after they arrived in the Americas. Nor was it known at what latitude they had crossed the Atlantic. The fossil discovery supports the hypothesis of a westward migration predating a northward migration, less than 10 million years after the appearance of the first whales in the region around India and Pakistan. (2019) Lambert, O., G. Bianucci, R. Salas-Gismondi, C. Di Celma, E. Steurbaut, M. Urbina, and C. de Muizon. An Amphibious Whale from the Middle Eocene of Peru Reveals Early South Pacific Dispersal of Quadrupedal Cetaceans. (United States.) Current Biology 29: 1-8.